The Embraer Phenom 300 interior is one of the innovative cabins in the light jet class. Embraer teamed ups with BMW DesignWorks USA to design the Embraer Phenom 300 cabin/interior. When entering the Embraer Phenom Interior/Cabin there is an airstair door that allows for easy entry into the Phenom 300 cabin. The Embraer Phenom 300 is the only light jet with an actual airstair door (steps integrated into the door). Embraer wanted to create the best amount of space available in the cabin, so Embraer invented the Oval Lite cross section for the Embraer Phenom 300 interior. This Phenom 300 cabin design allows more room for passangers to stand up and have more room in the cabin, without changing the size of the Phenom 300 light jet. Embaer also says that the Embraer Phenom 300 cabin has the largest windows, cockpit and galley in the light jet class. 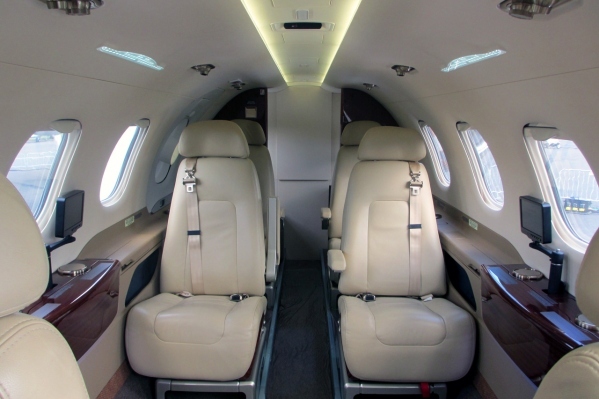 The Embraer Phenom 300 interior is capable of seating up to 11 people including the pilot. The Embraer Phenom 300 seats can swivel and slide backwards and forwards. The Phenom 300 seats can also recline to create a bed, giving passengers more comfort. The Embraer Phenom 300 interior also has a belted lavatory and optional sink available. In the front of the Embraer Phenom 300 there is options for a full galley, or half galley with a seat, or a half galley with a double seat. Above Embraer Phenom 300 Interior - Cabin Photo by Jetrequest.com on Wikimedia Commons. Photo (only) released under a Creative Commons License. Phenom 300 Interior Height: 4 feet 11 inches. Phenom 300 Interior Width: 5 feet 1 inches. Bottom Width: 3 feet 7 inches.